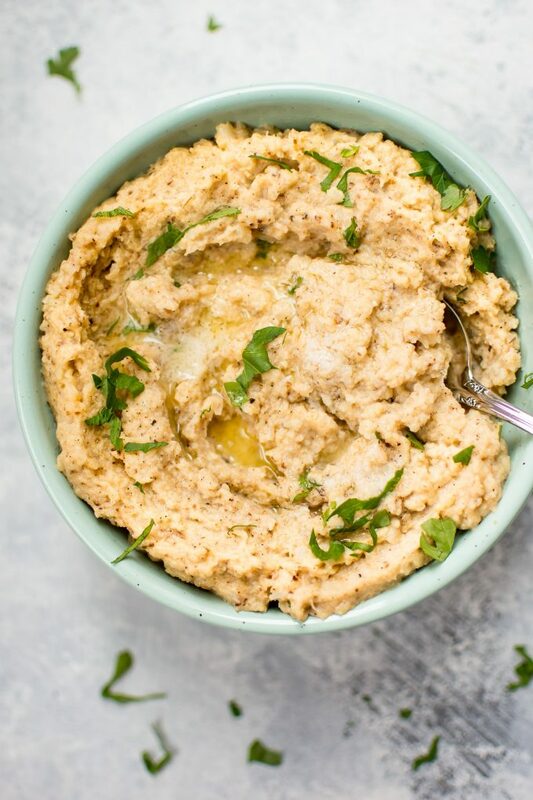 This roasted mashed cauliflower recipe is an easy, low-carb keto alternative to mashed potatoes. The cauliflower is roasted with garlic and an a delicious assortment of herbs and spices then puréed into a silky mash. Would I ever totally give up mashed potatoes? No. But it’s always good to have options. 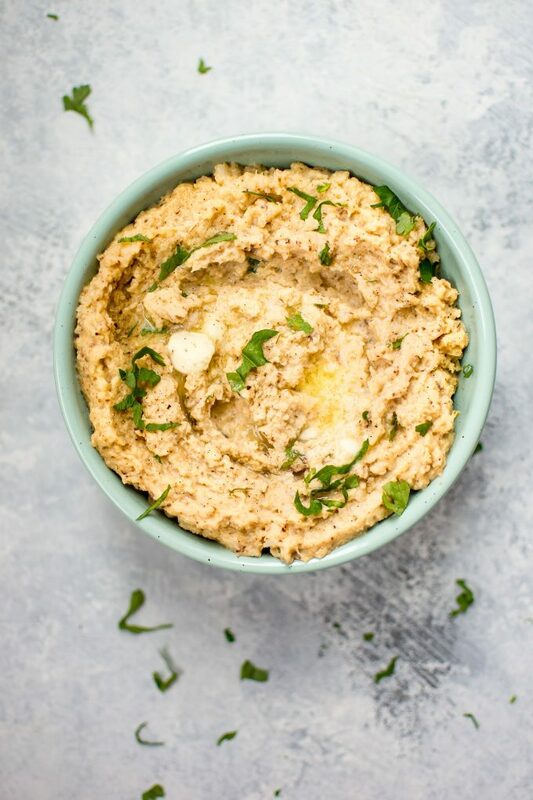 This keto roasted cauliflower mash is an easy side dish that has added flavor because it’s not just plain ole boiled cauliflower that we throw in here. Nope. We roast it first. Like I’ve mentioned in previous posts, roasting cauliflower is the way to go. Cauliflower still seems to be having a moment, so I’m going to go with it. 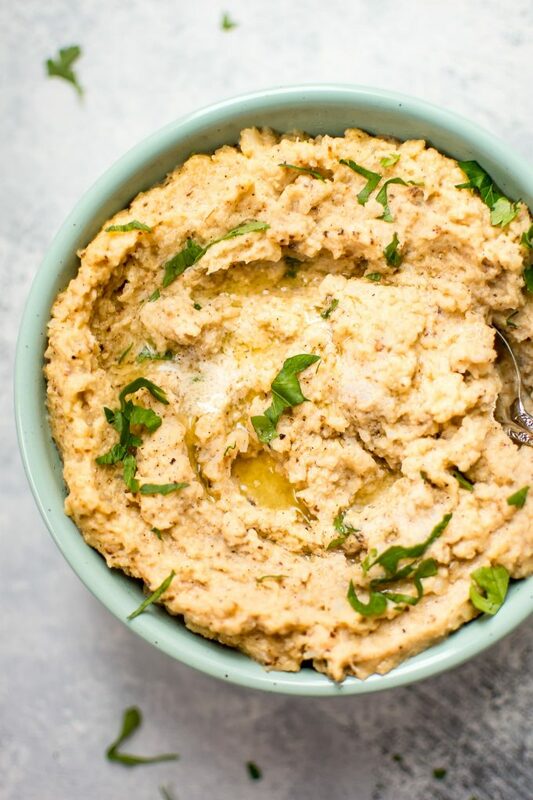 If you’re looking for a tasty low-carb side side for your holiday table, this is it. I always like to add herbs to mashed potatoes, so I did the same with this mashed cauliflower recipe. A little cream and butter make it nice and silky. If you don’t need this recipe to be keto, feel free to use milk… I have made this recipe with skim milk before successfully. Roast cauliflower florets at 450F for 20-25 minutes with the oil and seasonings. Add butter and cream to a pot over medium-high heat when the cauliflower is almost finished roasting. Once the cauliflower is cooked, add it to the pot. Using an immersion blender, you can purée it right in the pot. Purée until it’s as silky as you wish. Make sure to season it well and add the fresh parsley if you wish. 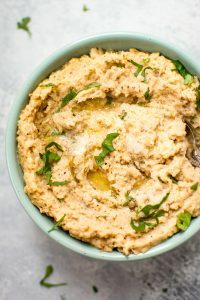 It is really easy to make keto mashed cauliflower. Would you give mashed cauliflower a try or will you stick with mashed potatoes? Preheat oven to 450F. Move the rack to the middle position. Prep the cauliflower and add it to a baking sheet. Toss it with the oil, garlic powder, Italian seasoning, smoked paprika, and salt & pepper. Roast the cauliflower for 20-25 minutes. When the cauliflower is about done, add the butter and cream to a medium-sized pan on medium-high heat, and warm it until the butter has melted. I recommend starting with 1/4 cup and adding more cream if necessary. Add the cauliflower florets to the pan with the cream and butter. Use an immersion blender to purée the cauliflower. Season with more salt & pepper if needed. Serve with extra butter and a sprinkling of parsley or other herbs if desired. This is the trusty immersion blender I used for this recipe. Omg this is something of yours I’d actually love. Are you bringing it on Christmas Eve? Perfect recipe for when you have guests who are on specific diets! They look delicious!